I am so excited today! As we approach the anniversary of the Battle of Hastings (this weekend. I will toast Harold and cry a bit) Helen Hollick has popped by with a post about Harold Godwinson’s supposed oath of fealty to Duke William of Normandy (Bill, in the below). Personally, I am stuck on the “grubby fangers” – but you’ll have to read on to understand why that made me laugh myself silly. On a more serious note, this so-called oath was in some ways the instrument of Harold’s downfall. Whether coerced or fooled into swearing on the remains of a saint, Harold had in fact pledged himself to William. The more pragmatic among us (and men were mostly pragmatic back then as well – William himself is a living, breathing example of that) would snort and say he did what he had to do to get out of a tight spot. 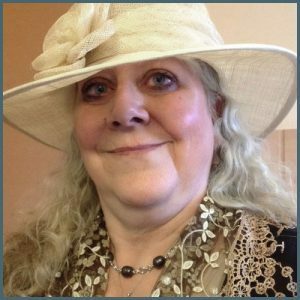 To Harold’s contemporaries, however, an oath sworn with your hand on a casket of holy relics was an oath to God, and such things could not be broken lightly… Right: no more from me – instead, I give you Helen! Sometime in 1063 or 1064 (or thereabouts, such a pity we have no detailed diaries from the people of the 11th Century – or elsewhen for that matter!) Earl Harold of Wessex boarded a boat with some servants and several chaps whom we would nowadays call bodyguards or special service police. He also took some carefully chosen, expensive gifts – hunting dogs, hawks an odd looking zigzag thingy and sailed across the Channel heading for Normandy. We know what he took because his departure is featured in the Bayeux Tapestry. (Including the image of the chap holding that zigzag thingy.) The crossing went a little awry, however, as he was blown off course and landed further up the coast than intended and was promptly arrested and thrown in the clink. Duke William of Normandy came to hear of the embarrassing situation and promptly sent stern word via a few Hefty Chaps (and a dwarf) (don’t ask) to secure Earl Harold’s release. 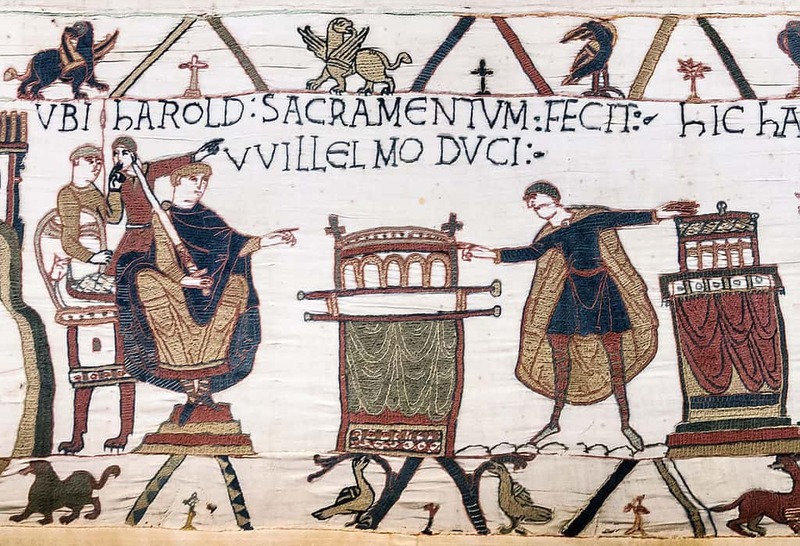 Thus Harold found himself as an honoured guest at the court of Duke William of Normandy. He was treated as family, went on a campaign with William into Brittany to sort out a few more ‘misunderstoodings’ that had severely annoyed the Duke. It is also possible that while there, William offered one of his daughters in marriage to Harold – this is my own thought, admitted, but it would make sense for Earl Harold was the most powerful man in England – he ran the country, not the King, Edward, later known as The Confessor. For Normandy to ally with England via marriage was an obvious manoeuvre on William’s part. All that (apart from the dialogue and my conjecture about marriage) is fact. What we don’t know is why Harold set sail to where he had intended going. Had he intended to pay a visit to Normandy, or had he somewhere else in mind? We’ll never know for sure, but it does seem that Normandy was the destination. There are two reasons: one is the Norman version and one, conjecture again, but conjecture backed by solid fact. Let’s backtrack in time a little. In 1052 Earl Godwine of Wessex (Harold’s dad) fell out with King Edward. The Normans were to blame. 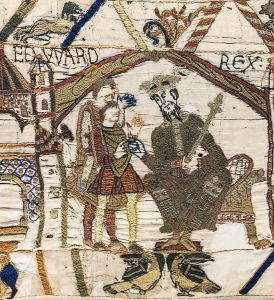 Ed was very pro-Norman – after all he had spent many years there in exile from England when his Mama, Emma of Normandy, in order to hang on to her Queen’s Crown, had married the Danish conqueror King Cnut, her previous husband (King Æthelred, Edward’s father) having died. Emma was William’s great aunt, his grandfather’s sister. There was a fracas at Dover in which the Normans came off worse, complained to the King and demanded justice. Earl Godwine, as head man over all of England’s south coast, refused, saying the foreigners had started it. Cut a long story short, Edward had a tantrum and kicked Earl Godwine and his entire family out – including the daughter, Edyth who happened to be Edward’s wife. The family fled into exile, (I won’t bore you with details) suffice to say, after a short while the Godwines came back in force with an army and navy as backup. Edward had to capitulate, gave Godwine and his sons their earldoms back, re-instated Edyth as queen and told the Normans to clear off home. This they did, but to ensure safe passage took a couple of hostages with them: Godwine’s youngest son and grandson, Wulfnoth and Hakon. And there in the Norman court they stayed until Harold arrived in circa 1064. It therefore seems logical that this was the reason Harold went to Normandy, to secure the release of his kindred. He did indeed return to England with Hakon. With the visit to Normandy lasting several months, Harold reached the point, probably near Christmas or Easter (again no detailed diary entries) of wanting to go home. But then another of those ‘misunderstoodings’ occurred. It was the time of year when all William’s ‘knights’ (the term wasn’t used then but you get the drift…) had to swear fealty – loyalty – to their overlord, Bill. One by the one all the bigwigs pledged their oath and kissed the ducal ring. Now we come to the Norman version of why Harold was there. It is very possible that Duke William visited Edward in England during those months when the Godwines were in exile. His Great Aunt Emma was elderly and dying, he and Edward would have known each other well while Ed was at the court of William’s father. A visit seems entirely feasible. While William was there, the Normans claimed, Edward, who had no children (and at that moment no wife) promised to make William his heir. It is probable that Edward did do this – not mincing words, but he was a bit of a naïve idiot, a hopeless, gullible king who would have been better off as an abbot or bishop. The point is, he had no right to do so, nor did William have any right to assume he would be heir to the English throne. For one thing, the Englishmen would not have wanted him (they rather hated the Normans) plus English kings, prior to 1066, were chosen – elected if you will – by the Witan, the Grand Council. Yes, usually a king’s eldest son was selected because he was the most ‘Kingworthy’, the best man for the job, but primogeniture was not a foregone conclusion. So, back to Normandy, that feasting and loyalty oath swearing party. Harold suddenly found himself in an awkward position. William demanded that Harold was to pledge his promise to acknowledge the Duke as England’s next king when the time came. (And with Edward getting old and frail, that time would not be too long ahead.) Very reluctantly, Harold agreed, bent his knee and kissed William’s ducal ring. But that wasn’t enough for Bill! He demanded that Harold was to swear on holy relics – to place his hands on a casket of sacred bones and pledge his oath before God. What was Harold to do? If he said ‘non’ he would likely be held captive in Normandy, his men, brother and nephew put to death. He had no choice. Through gritted teeth, and no doubt much anger, he had to swear. Satisfied, William allowed Harold, his men and nephew to go home. Wulfnoth he kept as a hostage. He never saw his freedom again. But that oath leapt up to bite Harold on the bum when Edward died on the 5th January 1066. Harold, as the most kingworthy was elected and crowned. When William heard he declared war. And thus the Norman Conquest began. But think on this. Is an oath made under duress a binding oath? If to make such an oath is the only way to ensure your freedom – your life – is it binding? Add to that, Harold had a ‘duty of care’ for his kin and the men who had sailed with him. It was a Saxon lord’s duty to protect those who were loyal to him. Even if that meant swearing false before God. Thank you Helen for this. 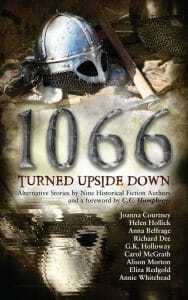 Follow a short series of articles about the events of 1066 on Helen’s Blog. Click Here and follow the <previous – next > links at the end of each post. Also, if you want to read Helen’s version of the oath-taking ceremony (and trust me, you do. Oh, YES, you do!) then follow this link to read an excerpt from Harold the King. 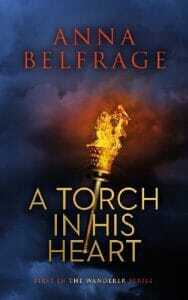 Not only has Helen written several books centred round the events in the eleventh century, she has also written a great series about the forever king, Arthur. And then, of course, we have her wonderful, wonderful books about the dashing, opportunistic, brave, dashing, intelligent, dashing (I’ve said that before, haven’t I?) swash-buckling and generally very intrepid pirate Jesamiah Acorne. Give me a man with blue ribbons in his hair any day, I say! As long as there’s no reference to celery…. Great post, Helen, and thank you to Anna for hosting. It was recognised under cannon law, that an oath taken under duress could be rescinded at a later date when it was safe to do so. Unfortunately Harold never got the chance to put his case to the pope like William did and so the pope only heard William’s side of it. Harold obviously didn’t go there to offer support to William upon Edward’s death, no he went there, as you say, to negotiate the release of his kin, as told very clearly by Eadmer. Harold made the mistake of going there but like a dog, the scheming manipulative William was not going to let go of the bone and he must have thought he’d died and gone to heaven when Harold washed up on his shores. But of course he did swear (and I think we have to believe Bill on this one) and whether or not Harold betrayed his oath or was coerced into taking it makesd no difference. But perhaps one of the pertinent points is: did Bill know of the Witan system (surely he must haver done?) and even if the oath was to support him in his ‘legal’ application (at the appropriate time) did he really believe that even with Harold’s backing, he would get what he wanted? Yolu can delete this bit if you like, but I am not sure if I would want to kiss the Ducal ring …. Such an entertaining account! It does make sense that he would have sworn the oath when he did and for the reasons you gave. I have to wonder what that zigzag ‘thingy’ was.